Free public lessons take approximatly 1 to 1.5 hours. Within 15 minutes, we can show you how to swing the mallet, put your ball through the wickets, and explain the rules. The rest of the time you can play games, either doubles mixed with experienced players or singles/doubles with other new players. You can stay longer and play more if you like. 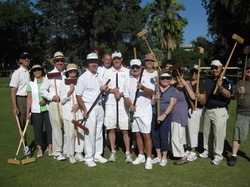 Be careful, the more you play, the greater the odds that you will get hooked on croquet! 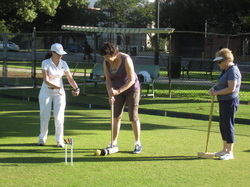 In the Spring and Fall of each year, we hold four-week Beginners, Intermediate, and Advanced croquet classes. The four week class costs just $20 ($40 for non-PCC Club members). Each session lasts about an hour, and you will learn one new skill shot and increasingly more sophisticated strategy. After class, stick around and play pick-up doubles games, using the skills and strategy you just learned! We limit the classes to just eight people so we can give each player more individualized attention. So don't delay in signing up! If you are interested in further details and the upcoming class schedule, contact us.